The Thompson Reuters/Jeffries Commodity Research Bureau Index ( CRB Commodity Index ) is a weighted index of 19 commodities. These commodities trade on exchanges worldwide, composed of energy products, precious and industrial metals, and agricultural commodities. We typically perform a relative strength analysis of gold or silver versus the CRB commodity index below our primary precious metals charts. This gives a quick reference to see if other world commodities impact gold and silver. Funds and institutions will often buy “a basket of commodities” for investment purposes all at once. Or, if there is something unique happening to the precious metals irrespective of other commodities. Although the weightings and components of the index have changed since it was first published in 1947, the CRB commodity index is still largely the best measure we have for broad price trends amongst major world commodities. The 19 specific contracts now included: aluminum, cocoa, coffee, copper, corn, cotton, crude oil, gold, heating oil, lean hogs, live cattle, natural gas, nickel, orange juice, silver, soybeans, sugar, unleaded gas, and wheat. The most important point to note on this chart is that global commodity prices are currently at lows in over 40 years. Commodity prices are lower than they were during the dot-com bubble. They are lower than the recession of 2001. Finally, they are lower than during the worldwide financial crisis of 2008-2009. To imagine that the global demand versus supply equilibrium for industrial & agricultural commodities is weaker than it was during the most significant financial crisis of our lifetimes is difficult to fathom. However, it is what the charts are telling us. 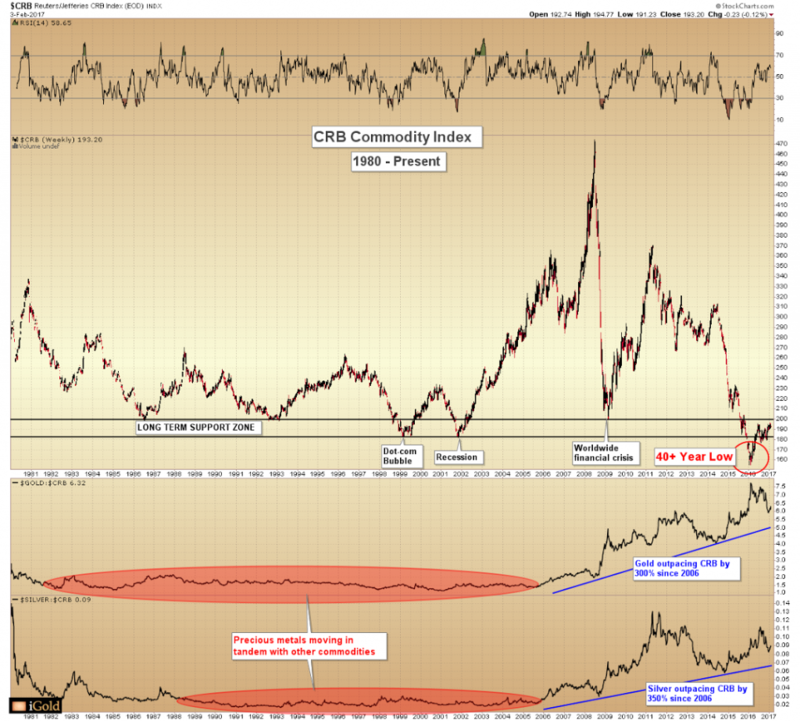 Below the main chart are ratios showing gold versus the CRB; and silver versus the CRB. These ratios indicate the relative strength between the precious metals and the 19-commodity CRB Index. Here we can see that gold has outperformed the basket of commodities 300% since 2006? While silver has outperformed by 350%? Another data point we can reference is that while the CRB is now below its 2008 financial crisis lows, the gold spot price is still well above its 2008 crash low of $680 per ounce. Additionally, silver is at $8.50 per ounce respectively. Thus… something happening to the precious metals that are not happening within other commodity markets. Here is strong evidence that the investment world is not treating all commodities the same. What is Relative Strength Telling Us? This outperformance since 2006 is in stark contrast to the near tandem price action that bound precious metals to the rest of the commodity complex between 1982 and 2006. This performance is visible from the nearly flat-line. The relative strength charts during that timeframe (red highlights). We speculate that starting around 2006 a particular portion of investors began to favor the precious metals for their historical monetary roles. This was, amidst increased monetary debasement by central banks and unsustainable debt loads by a world government. Additionally, this is a demand that is above and beyond the usage the metals have in industrial fabrication. Yet, that is what was appearing across the rest of the commodity complex. We anticipate that the divergence between precious metals and other commodities which started in 2006 will see the initial stages of what will become a larger worldwide phenomenon over the coming decade. It is important to note that it is best to observe relative strength indicators as markets decline. Hence, we can see evidence of underlying accumulation happening behind the scenes. What we see is that physical buyers have been accumulating precious metals even as their prices were falling alongside other commodities. Rising relative strength is essential to observe during declines because it shows us which sectors should lead when the overall commodity complex finally bottoms. For example, it is likely that oil bottomed in early 2016 at $26 per barrel and natural gas bottomed similarly at $1.60 per million British Thermal Units (MMBtu). While there will be opportunities across the entire commodity complex over the next several years, relative strength indicators are telling us that precious metals are poised to lead the advance. They will be higher as stabilization occurs across the entire commodity spectrum. Christopher Aaron has been trading in the commodity and financial markets since the early 2000s. He began his career as an intelligence analyst for the Central Intelligence Agency. The CIA is where he specialized in the creation and interpretation of pattern-of- life mapping. Technical analysis shares many similarities with mapping. They both base on observations of repeating and embedded patterns in human nature. His strategy of blending behavioral and technical analysis has helped him and his clients. It has helped to identify both long-term market cycles and short-term opportunities for profit.